Dr. Gangrene's Mad Blog: Women in Horror Month – Sham or Sincere? The post I made a couple days back led to some interesting discussion with the Gore-Met on the Rue Morgue Blog and got me thinking about Women in Horror Month a bit. Women in Horror Month is more than simply a month where people are encouraged to celebrate women in horror. WIHmonth is an official non-profit organization, a 5013c organization. It is a sister organization to the Vicera Organization, another 5013c not for profit organization. They’re the ones that hold the Viscera film festival, which features films created by female filmmakers. 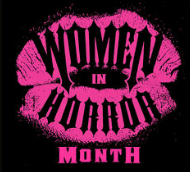 Their official website is: www.womeninhorrormonth.com - WIHmonth began as a blog post, a manifesto, as their website calls it, by Hannah Neurotica. It was a proposal to create a month-long celebration of women in the field of horror. There is a board of directors – Hannah Neurotica, Jovanca Vuckovic, Debbie Rochon, Heidi Honeycutt, Jen and Sylvia Soska, and Shannon Lark. All of these women work within the horror field in varying capacities as writers, producers, actresses, directors, and more. Their mission, as stated on the website: Women in Horror Recognition Month (WiHM) assists underrepresented female genre artists in gaining opportunities, exposure, and education through charity events, printed material, articles, interviews, and online support. In addition, WiHM seeks to expose as well as break down social constructs and miscommunication between female professionals while simultaneously educating the public about discrimination and how they can assist the female gender in reaching equality within the film industry. It is stated plainly in the mission statement that one purpose is to gain exposure and opportunities for women, specifically underrepresented ones. Of course the organizers gain exposure and promotion for themselves, too, by being involved in this, there really is no way not to. But I really don’t believe that is their main purpose. Their vision, again posted on their website, is: A world wherein all individuals are equally given the opportunity to create, share, and exploit their concept of life, pain, and freedom of expression. Is the horror field an equal playing field for men and women? I honestly don’t think so. The last part of their Mission Statement talks about informing the public in “how they can assist the female gender in reaching equality within the film industry.” Things are better in that regard than ever before, and the work of organizations such as Viscera and the people who champion their cause certainly have helped with that, but there is still a long way to go. I think it’s unfair to say it is only for self-promotion that this celebration was started. Chris Alexander, editor of Fangoria Magazine, caught a lot of flak for casually dismissing it in an editorial where he said WIHM was merely politicized and could “eat it.” I think Chris’ main point was that he feels WIHM is unnecessary and that Fangoria does much to promote women in horror year round, so there is no need to do so simply for Women in Horror Month. THAT part of his argument I actually agree with. He can and should feel free to write about women (and men) and events year round without pressure because of this or any other event. If he had just left off the eat it part I think he’d have made his point much better. Look, I kind of get where he’s coming from. I mentioned in a post on the Rue Morgue blog today that I have shied away from interviewing women during WIH month because it almost seems like I’m only interviewing them only because of that movement, which is insulting to say the least. In a way that almost achieves the opposite of their desired effect, I guess. But I am aware of what is going on that month, and support their movement, and in that way they are achieving their goal. Perhaps the fact it was created BY women in the horror field makes it seem dishonest to some people, but you know what? If these women hadn’t created WIHM it never would have happened, and it does raise awareness of many worthwhile projects and creators. So they hold their own celebration of women for the month of February. What’s the problem? Maybe some people object because they, as men, feel excluded. I think like everything else, truth be told, there are positive and negative aspects to it. I wrote a post a couple of years back about having a problem with someone campaigning for an all women vote on the Rondo Award ballot. While not a direct endorsement by WIHM I believe it was spearheaded by someone in the organization (sorry memory is faulty here). The purpose of the Rondo Awards is to celebrate the best work of the year in the field of horror, and someone voting an all female ballot is as wrong as someone voting for a strictly male one. I get the sentiment behind that but I feel it’s misguided in this instance. We’re not voting on favorite gender here, we’re rewarding the work of people regardless of it. 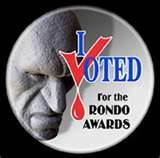 Speaking of the Rondo Awards I also have to say I disagree with WIHM being added as a category for Best Event in the Rondos. WIHM is a series of events all under one banner. Now in full disclosure I have to admit that category is one I’m usually nominated in, but that isn’t the reason I disagree with it. I have no problem with WIHM events being nominated, and in fact agree they should be, but each event should be nominated separately, not all lumped together. They’re different events that occur at different times and places, and should be nominated as such. She got a LOT of responses, both pro and con, from both men and women on both sides. Very interesting reading. Thank you for the thoughtful article. You're welcome, Hannah. You're doing a great job and the criticism deserves to be met head on and shown for what it is - nonsense!